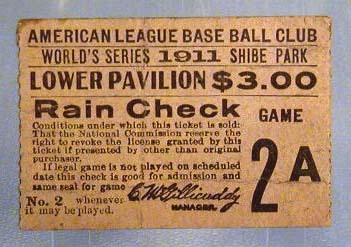 Game 2 of the 1911 World Series will be played this afternoon. If you’ve already got your ticket, then have fun at 21st and Lehigh! If not, join us here at 2 p.m. as we will carry the game live. Details forthcoming, as well as a look at today’s pitchers, Rube Marquard and Eddie Plank.